Use directly on desks for instant personalized whiteboards. Cut into shapes and stick to classroom walls for customized learning. Replace boring book covers with creative whiteboard designs. Stick directly on to floor for fun classroom games. Simply adhere to the classroom wall at kids' eye level and let kids scribble away! Place in entryway for important family messages. Label toy boxes, bins, and other storage containers. Use in kids' rooms to encourage a creative (and clean) space to write, draw, and design. Plan family menus by sticking the chalkboard decal right on the fridge. Keep the family organized with daily to-do lists. Stick on filing cabinets to make custom lists and labels. Connect multiple blackboard stickers to cover an entire wall for unlimited brainstorming. Easily assign and switch out daily tasks. Make holidays extra special by wrapping gifts with our blackboard decal. Use as a custom photo backdrop. Cut into smaller sections to use as name tags. Bonus: 3 Whiteboard Markers Inside! To use the markers for the first time, please press the tip first, shake the marker for several times, and then press the tip until it is filled with ink. If it doesn't come out with ink for 3 minutes, please contact us at afmat@outlook.com. We are eager to make things right! 【Longer and Thicker White Boards for Wall】Each roll measures 118*17.7 inch (L*W). Made of thicker vinyl material and strong adhesive, the white board wall decal won't fall off easily. 【Peel and Stick Dry Erase Sticker】Simply peel off the backing paper from one corner and stick to any clean and smooth surface. To apply the entire dry erase wall decal, we suggest two people work together and use a soft cloth to avoid wrinkles and bubbles. 【Easy to Remove and Clean】The dry erase sticker is easy to remove and the marks are easy to clean without any residue. 【Multi-functional Dry Erase Paper】Use it as a traditional white board or a projector curtain wall, it can also be posted on the arc-shaped surface and cut into any shape. 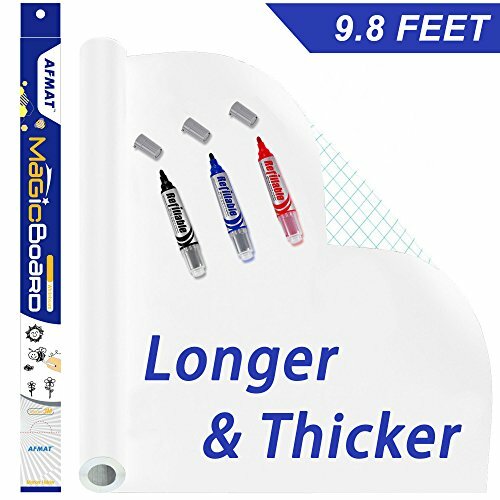 【3 High Quality Whiteboard Markers】: This white board sticker comes with 3 free markers with 800 meters writing distance. Any questions, please contact us at afmat@outlook.com. We will make things right beyond your expectations! If you have any questions about this product by AFMAT, contact us by completing and submitting the form below. If you are looking for a specif part number, please include it with your message.